Apple's upcoming iOS 10.2 and tvOS 10.1 updates will bring a new "TV" app where users will be able to view much of their TV and movie content from across various apps, all centrally located to make it easy to pick up where you left off and receive recommendations on additional content. The new TV app has been gradually going live on both platforms for U.S. users during the beta testing period, and it works hand-in-hand with a "Single Sign-on" feature that will let subscribers to certain pay TV services authenticate their accounts once on a systemwide basis and receive access to content across all supported apps for which they are eligible. When the early beta of Single Sign-on began going live earlier this month, there were four supported TV providers, with Dish Network and its Sling TV subsidiary being the most recognizable while small regional services GVTC Communications and Hotwire rounded out the list. Full support for Single Sign-on will require apps to be updated to recognize the systemwide authentication, but the provider listings have offered a glimpse at which providers are currently on board with the feature. 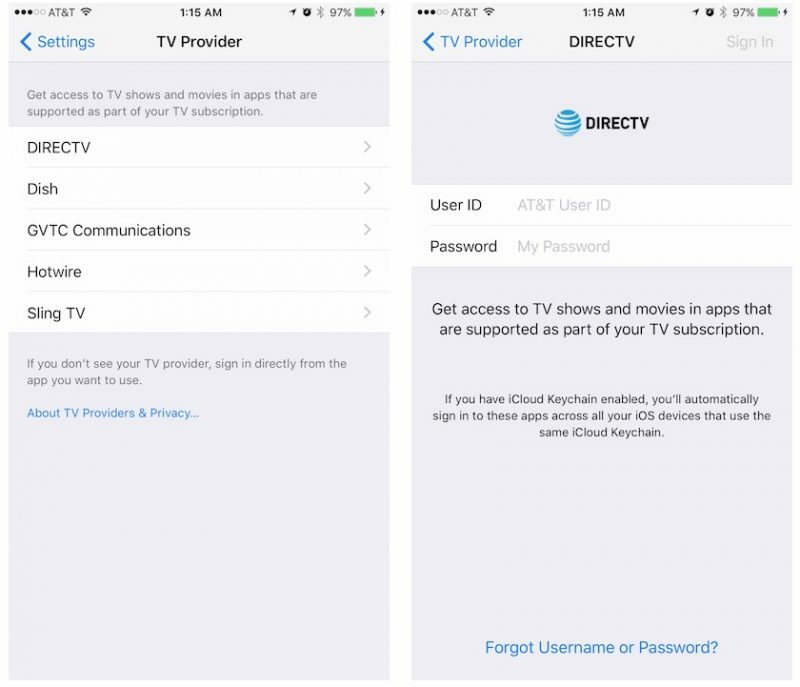 As of this week, another major provider has joined the Single Sign-on program, with AT&T's DirecTV now appearing in the TV Provider list for authentication. The addition of DirectTV's 20 million U.S. subscribers makes it the biggest provider to support the feature so far, displacing Dish Network and Sling TV. The addition of DirecTV isn't necessarily a surprise, as Apple had touted "DirecTV, Dish Network, and more" in its press release announcing the new TV app last month, but it's apparently taken DirecTV a few extra weeks to prepare. Still notably absent are the major U.S. cable companies such as Comcast and Charter/Time Warner, and there's no word on if or when those companies will be coming on board. Apple has announced that the new TV app will become available to the public in December, indicating the company intends to release iOS 10.2 and tvOS 10.1 within that timeframe. I think hell will freeze over before Comcast is on that list. They don't seem too thrilled about Apple's plans. They are going to announce launch plans on Nov 28 (Cyber Monday). It MAY launch that day, not sure, but they are having a big press release event about DirecTV Now. I'm really hoping it integrates into the TV app as well, that would be killer. Awesome news. Also nice because I'd rather move towards using the AppleTV more, as I'm not wild about the DIRECTV user interface. Come on Time Warner Cable | Spectrum! I also thought it meant DirecTV Now. It is supposed to launch on Monday. Not sure if it is working yet. Course they just launched it. I tried downloading some tv apps to see if it works as advertised. And those apps still prompt to go online to sign in to my provider. Guessing they all need to be updated to recognize the single sign on feature still. Anyone else having issues signing into DIRECTV in the TV provider settings? I can log in to the website and individual apps but I get an error message in the TV provider settings.